Archibald Plumby cannot look up … well, at least not very far up. His entire life has been spent underneath the shelter of lowered ceilings and umbrellas for the slightest glimpse upward sends him into a panic. Archie has learned to live with his particular set of circumstances. In fact, he has an idyllic life in a picturesque coastal town called Outlandish. He lives with loving and accepting parents, eats fine food at his mother’s cliffside restaurant and spends his days on the beach and in the town’s quaint streets in search of stories to write for his part-time job at the local newspaper. On his twentieth birthday, as thoughts of the future begin to weigh on Archie’s mind, photographer Tallie Greenleaf comes to town and is drawn to this curious young man and his ever-present umbrella. She approaches him, hoping to get his permission to photograph him—but destiny has brought Tallie to Outlandish for so much more than a photograph. The community and residents of Outlandish are outlandish and that is their beauty. Archie of Outlandish is a story of viewpoint; yours and mine, good and bad, changing and growing. Lynnette Kraft has an enviable way of looking at the world and she shares it with us through Archibald Pumbly. Archie provides a fascinatingly intelligent yet childlike view of the people and world around him. Archie observes. He does not do do do go go go. He is at peace and quietly watches. His view is incredible! It equates to viewing the world through the lens of Christ's love. In the community of Outlandish, amongst its quirky characters and lovely history, lessons abound. A few of those lessons are that it is important to seek God’s guidance, that diversity is good, and that in order to find the precious gems in another one must keep an open mind. Oh what we can miss out on when we don't open our hearts to those around us who are a bit outlandish. Archie of Outlandish broke my heart a little in the very best of ways. Kraft says that “stories can transform people". This one will! Lynnette Kraft she has two very talented family members that take her stories beyond incredible to brilliant. Archie of Outlandish includes a companion soundtrack (18 tracks) created by film/media composer, Jared Kraft. Find it FREE on Amazon. Archie of Outlandish also displays a lovely variety of illustrations created by artist/illustrator, Abigail Kraft. I received a review copy in exchange for my honest and unbiased review from the author. A side note… in the case of Archie of Outlandish I shamelessly contacted Lynnette Kraft for a review copy because I am a huge fan of her earlier novel Ingrid. I was pretty positive that I would love the book and I do. I want to be sure to state for your understanding that even though I went and begged for a copy I always provide an honest and unbiased opinion on all books that I review. 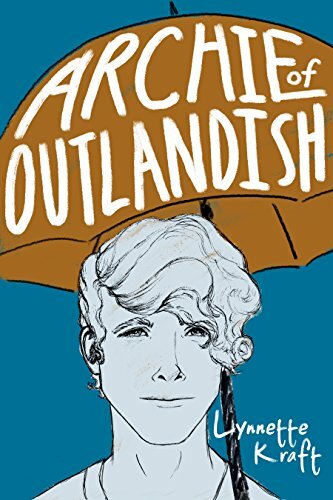 Archie of Outlandish deserves it’s five stars! Lynnette Kraft loves good stories: Watching them, reading them, telling them and creating them. Being a thinker, a people-watcher and a nature-lover, she captures inspiration for her stories by observing life around her. She lives with her family in California’s Central Valley and enjoys day trips to the coast where she likes to dream about coastal living as well as capture its beauty through photographs. Jared Kraft is a composer for film/media. He holds a specialist certificate in “Orchestrating and Producing Music for Film and Games” from Berklee College of Music and has garnered high praise from all of the filmmakers he has collaborated with. On top of his compositional work, Jared is also a classical pianist, songwriter and piano instructor. Jared currently works out of a home studio in Fresno, California. Connect with Jared on Facebook and Twitter. Abigail Kraft is a visual artist and designer who chases whimsy to capture beauty. Her artwork, veering organically from the status-quo, can be described as imaginative, joyous and disarmingly intimate. Abigail loves spending time with her family, and gives glory to her creator for the gift of eyes that see the world just a little bit differently. I LOVE LOVE LOVE this book! I wish that I would have written a review at the time that I read it. I may just need to read it again :).